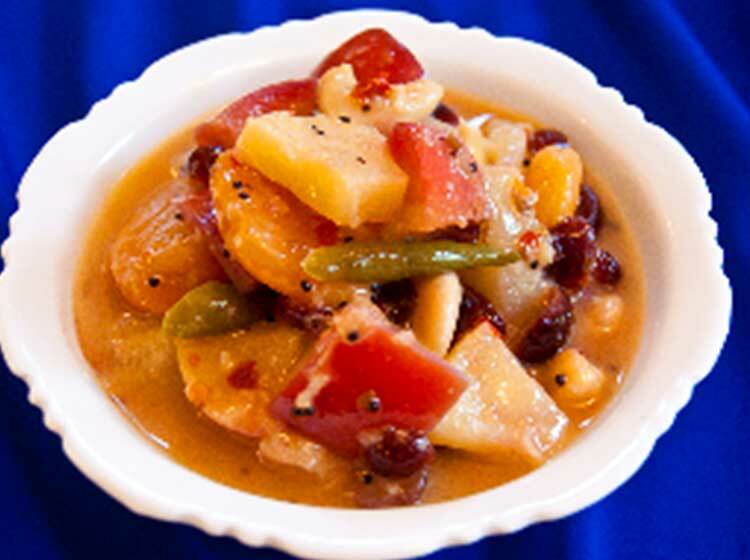 This recipe originates in South India where a combination of fresh fruits is cooked in fresh coconut milk. In this version I have used coconut milk powder. Any combination of fruits can be used and it is delicious as a summer side dish or as a light and refreshing dessert. Fresh apricots give it a luscious look, but I have used dried, ready-to-eat apricots to save time. Melt the coconut oil in a medium sized saucepan over a medium heat. When hot, but not smoking, add the mustard seeds and as soon as they start popping, add the cinnamon stick and ginger. Fry for 30 seconds, stirring. Add the cumin and fry for 15-20 seconds, then add the pineapple, salt, sugar, chilli powder and apricots. Pour in 150ml warm water, bring to the boil and reduce the heat to low. Cover the pan and simmer for 10-12 minutes. Meanwhile, peel and core the apple and cut into 2.5cm cubes. Cut the banana into thick diagonal slices. Add the apple, banana and raisins to the pan. Blend the coconut milk in 125ml hot water and add to the pan. Bring to a slow simmer and add the green chillies and curry leaves. Cook uncovered, for 8-10 minutes or until all the fruits are tender, but firm.